Remember to measure your pet for the paw-fect fit. Get your dog through those chilly fall and winter months with the Kurgo Loft Dog Jacket. A reversible, quilted jacket that keeps his core warm and dry without constricting his movement, it’s made from a rugged Microtomic Ripstop material with warm Polytech fill—with a versatile design that is suitable for the city streets and backwoods alike. The waterproof shell has a zippered opening so that you can access your dog’s harness and attach a leash, with two side adjustment points for a comfortable fit. Reflective piping adds visibility, making it the must-have accessory for dogs that love to go running, hiking and adventuring, even in inclement weather. Reversible, waterproof quilted jacket keeps dog’s core warm and dry while allowing movement. Made from a rugged Microtomic Ripstop material with 140g of Polytech fill for warmth. Reflective piping offers visibility for running, hiking and adventuring in inclement weather. 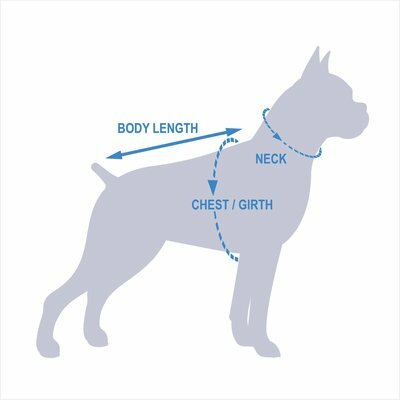 Two-way zipper allows you to access his collar or harness underneath and attach a leash. Double-sided adjustment points allow you to get a comfortable fit. Finally something that fit my boy!! Really nice jacket. My boy has plenty of room if he continues to grow. It's really well made too! I believe that it would keep him warm in the cold but I've yet to see him get cold. We live in the south so our winters aren't terrible but it does get chilly. I was honestly about to give up on finding a jacket that would fit. My boy is almost 100 pounds and has a 36 inch chest. This coat is perfect in every way. The quality, the fit, the color and the velcro closure is not flimsy like some can be. I usually have a difficult time in fitting my dog with coats and this was absolutely perfect!! I wanted to get her a nicer quality coat, so this is it! It is quality made, fits her length perfectly, and gives her enough room to be comfortable when she is playing outside! I love that you can use a harness with it and it has reflective material for our late night walks! Highly recommend!! This jacket seems to be very well made- Love that it’s very adjustable so we will get a fair amount of time out of it as our boxer fills out. The color is unique and really pretty as well. This is such a fun and cute coat! I love the colors. I evidently have a skinny dog with a long body, because it fits her perfectly, but doesn’t quite go past her rib cage. I got a small, since her measurements were on the smaller side of that size, but wish it would be a little longer. In hind sight, might have tried the next size up to give better coverage and hope it’s not too big. I love this jacket! We use these to layer for warmth, or just on their own! The dogs have full range of motion and can run comfortably with some extra warmth of winter hiking! Kurgo has an amazing lifetime warrantee, and I have been really impressed with the quality! I have used our new vest twice and it has worked perfectly. It keeps my 60lb GSP warm and looks really good on him. We purchased the blue/orange. I was concerned that the belly would go too far down his chest and get urinated on, but this vest gives plenty of clearance. The only thing that I can find fault with the vest is the reversible claim. The velcro is one sided and seems like it would be rough on his skin if I tried to use the orange side. I bought the blue color, thinking that the reverse side color was “hunter safety orange.” Instead, it is yellow. Hunting in Maine is a common activity as is hiking with dogs in autumn, winter, spring. White dog + snow + hunters = not good. Velcro attachment did not last. I bought this coat last winter for my 32lb active dog. The coat is fine except for the velcro attachment. My dog is very active and loves to run and play. The velcro attachment no longer holds when my dog is running and playing. This coat needs a stronger more durable velcro. I was reluctant to to buy a coat online. Followed the measurement guide and hoped for the best. It is snug around her neck and overlaps a little around her middle...which is 100% better than what she had. I have been stopped in the park with inquiries. Totally happy with the product.